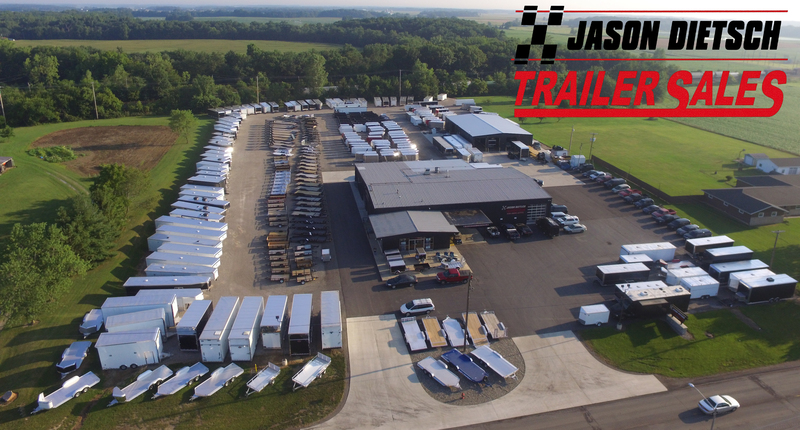 As the largest trailer dealer in Northwest Ohio, we normally have over 350 Trailers In Stock on any given day! And if we don’t have it in stock, we can get it ordered to your needs. Why Choose Us, What Do We Sell? We Proudly Represent the Following Great Companies That Build Products We Are Confident You Will Love Using. ATC Trailers started with a couple guys out of a garage, building a trailer a week. We're now a community of builders working side by side with our ownership. We are a dedicated group that's raising a family in the form of a small business. We all recognize that a good reputation is developed through building a quality product.Trailers they build; Toy Hauler, Race, Enclosed, Cargo Trailer, Gooseneck Car Hauler, Stacker Car Hauler, Snowmobile Hauler, Fiber Optic Splicing, Custom Builds. Offering superior value and innovation since 2003, Legend Manufacturing is committed to providing the best quality and craftsmanship at an affordable price. Our all-aluminum structural design and quality of build is unmatched in the trailer industry, and is backed by our LEGENDARY warranty. Whether you are snowmobiling, racing, working or traveling, our trailers get the job done every time. We offer a wide range of affordable and premium models for any work or play scenario. We carry and sell Renegade Customized Trailers, Trailers with Customized Living Quarters and Race Stackers. Gooseneck & TAG Designs are available. Renegade Motorhomes has 29 Standard Floor Plans as well as Custom Floor Plans Available. Freightliner, Volvo & Navistar Chassis with 350 HP to 600 HP Engine Choices are offered. Today Behnke Enterprises, Inc. has 90 employees and 225,000 square feet of manufacturing and warehousing in Farley, IA. They focus on manufacturing heavy duty trailers for the agricultural, construction, heavy haul, commercial, and OEM markets. We carry a variety of Load Trail Trailers includeing; landscape trailers, dump trailers, car haulers, and equipment trailers. Sure Trac builds Hydraulic Dump, open Landscape/Utility, Car Hauler, Equipment and Deckover trailers. RC Trailers offers Enclosed Customized Trailers, General Cargo Trailers, Sport Utility Trailers, Concession, Race Trailers, Open Aluminum Car Trailers, and Aluminum Motorcycle Trailers. American Hauler is our go to for our Signature 53' inclosed transport trailer and open equipment trailers.